Watchup is a great video news app for the iPad and a recent pick for our Best Free iPad App of the Week. 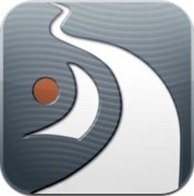 The app received another substantial update yesterday, to Version 1.11.0. One of the most notable items in this update is the addition of ESPN to the channel list. For sports fans this is very good news – as most of the app’s channels have been more general news up to now. It’s good to see the leading sports network added. Other new channels added in this update include the New York Daily News, This Week in Startups, and local channels from Boston and Portland. • Subscribe to up to 20 channels. 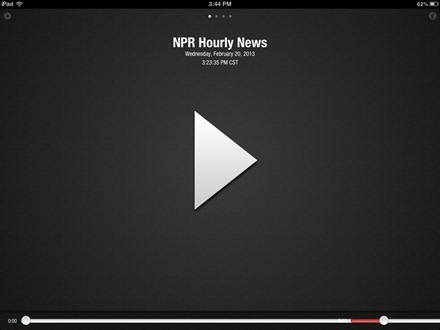 • Just turn the app on and your automatic newscast will play continuously. • Swipe to the next video, just like a magazine. • Want to browse videos per channel? Just pull down the top panel and pick your favorite clips to add them to the queue. 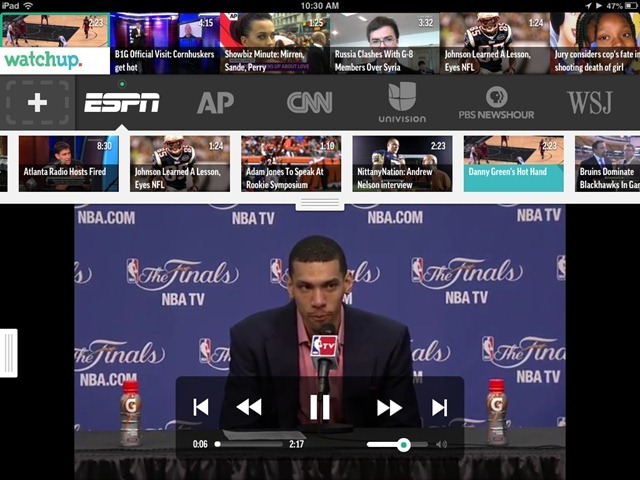 • Pull up the lower panel to reveal extensive descriptions about each video. • Multitask: subscribe or unsubscribe to/from a channel by pulling the left handle while watching. Watchup continues to be one of my favorite news apps on the iPad, and the developers have done a great job with frequent updates over recent months. Here’s an App Store link for Watchup for iPad; it’s still a free app. 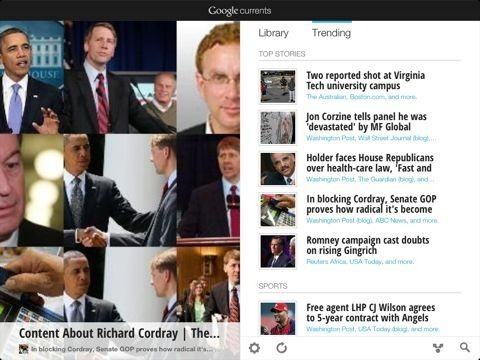 Google Currents Out Now in iPad App Store – Google’s Answer to Flipboard? They’ve partnered with over 150 publishers to offer full-length articles – publishers that include CNET, AllThingsD, Forbes, PBS and more big names. There’s also some sort of self-service platform for publishers. 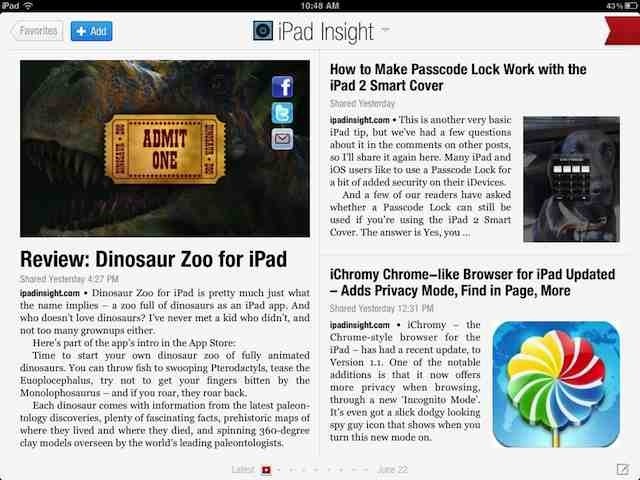 Flipboard – the brilliant and popular social news magazine iPad app – has had a major update today. The new version is 1.5, and one of the biggest additions in it is a new Content Guide. 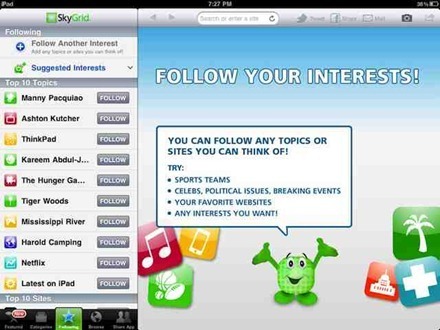 The Content Guide is described as an easy way to flip to anything that interests you at anytime. It’s implemented as a red ribbon at the top right of Flipboard screens; you tap on it to search for people, topics, or blogs you’re interested in. Or just browse through the built-in Flipboard sections and suggested content. You can also now add any section you enjoy as a favorite with a single tap. Another notable new feature in this 1.5 update is Linked In integration – offering access to more than 30 industry feeds and more from the leading business-focused social network. ★ Content Guide. Tap on the red ribbon to instantly access all your social networks, favorite sections, and a wide range of beautiful featured content. You can also search for any people, publications, websites or topics, such as National Geographic, Design or Ashton Kutcher. ★ Favorites. Save any section as a Favorite on Flipboard, even after you’ve filled up your first two pages. You can access the entire list in your Content Guide. ★ LinkedIn. The largest network of your trusted professional contacts is now on Flipboard. Add LinkedIn to create an industry magazine for reading what your contacts have shared, as well as news from over 40 industries with LinkedIn Today. ★ Popular. Popular stories are highlighted, making it easy to discover great articles being read on Flipboard. ★ Speed. Flipping is faster and diving into stories is more streamlined. A single tap gets you to the article, social interactions are now at the bottom of the page, and now you can flip from one story to the next to keep reading between articles, photos, and updates from friends. I’ve only just applied the update a short while ago, but the new Content Guide stuff looks very nice. 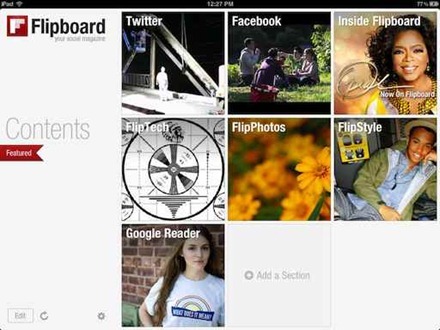 Flipboard in an outstanding app, one of the most innovative and iPad-like apps released on the iPad App Store. This update just helps cement its deserved reputation as the best iPad news / magazine title we’ve seen yet. Here’s an App Store link for Flipboard; it’s a free app. Fox News has launched an iPad app today, called simply Fox News for iPad. It’s a free app for now, sponsored by ExxonMobil, whose ads are shown prominently on all pages and as intros on many of the videos in the app. 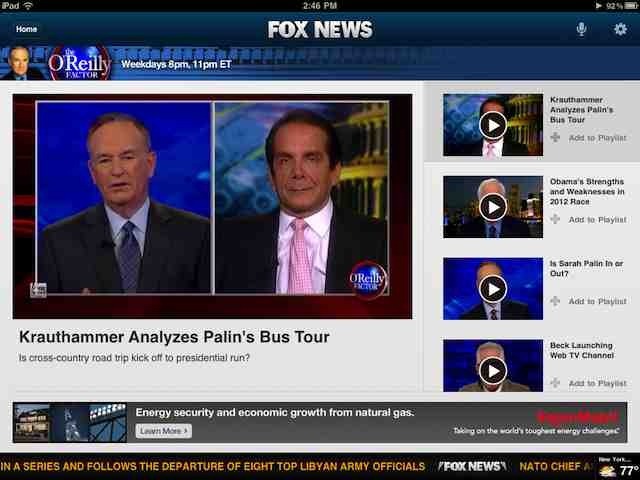 The app offers a lot of what you’d expect from Fox News and lots of coverage of breaking news. I’ve only taken a very quick look at it so far and Fox News is not my most watched news channel, but this app looks pretty sharp at first glance. Skygrid – one of the leading news apps for iPad and iOS – has been updated this week, to Version 2.0. The big addition in this new version is more and better ways to follow specific topics that interest you. You can now follow just about anything you can think of within the app – any topic you like, social networks, individual sites (like, say, this one right here), and you can see everything you follow on one tab in the app. Very nice. There’s already a handy ‘Latest on iPad’ topic to follow, which I’m hoping this site will be added to soon. Skygrid was already a very good news app that seems to have all the right algorithms and technology to bring breaking and top stories in as quickly as any app I’ve seen. This update makes it even more personal and customizable. 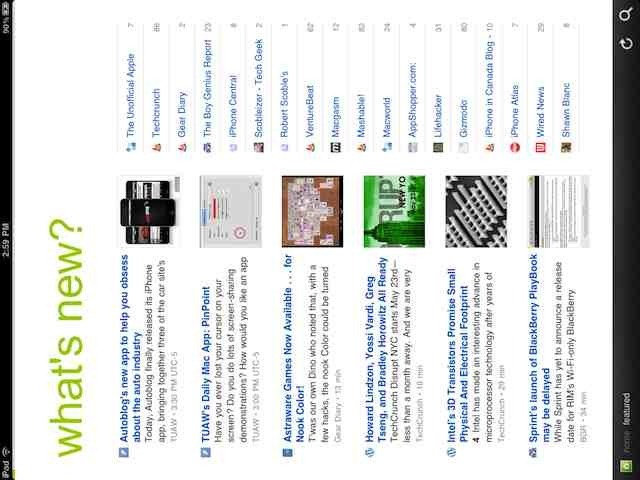 The screencap above is what a page looks like in Feedly on the iPad if you choose to turn your iPad into landscape mode. Feedly doesn’t recognize landscape mode at all, so you’re forced to use the app always in portrait mode. I think that’s a very bad design decision for any app that involves reading on the iPad. The way we choose to read on the iPad is both a very personal thing, and something that may well change depending on where you are, what time of day it is, and so on. This is just one of a number of very disappointing aspects of Feedly on the iPad. Another major one is that the app makes it very difficult to see all of your feeds, if you have more than ten. I have over 200 subscriptions, so seeing only 10 in the home page’s Featured area is really not much use at all. And there is no ability to choose which feeds show up in the featured section. So we’re forced into portrait mode and forced to go with whatever the app thinks is the right list of featured feeds. Very lame. Flipboard – the excellent, award-winning iPad social news magazine – has been updated this week, to Version 1.2.1. This update adds special Flipboard pages from Oprah, Rolling Stone magazine, Wired, Elle, and more – nicely expanding its range of custom content pages. Flipboard is conisdered by many to be perhaps the best iPad app yet. It’s certainly one of the flagship titles on the iPad App Store. As always, it’s good to see great apps not resting on their laurels and continuing to add new features and more good content. You can find this latest version of Flipboard in the App Store now; it’s still a free app. 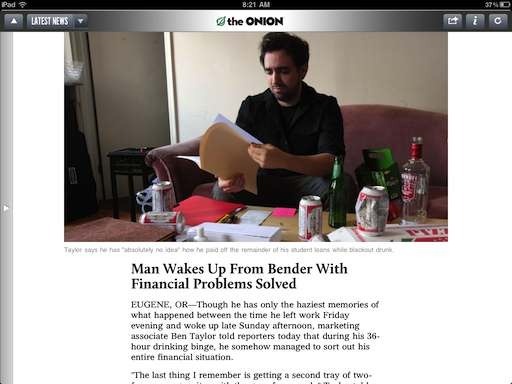 This is the official iPad application of The Onion, America’s Finest News Source. It is the last bastion of unbiased, reliable, and definitive news in a world dominated by superficiality, mediocrity, and non-Onion news outlets.